Immediately after graduating in July 1899, Vasily married Olga Nowik, and was ordained a deacon. On December 10, 1900 he was ordained a priest. That same month he left Breman for America. The young couple expected to be assigned to a parish in New York, but instead he was appointed to a parish in Alaska. Together with the newly-appointed Bishop Tikhon, he began his missionary service in the land of St Herman. Orthodoxy had arrived in Alaska with the coming of the monastic mission from Valaam in 1794. At the start of the twentieth century, climatic and social conditions in this vast territory remained difficult. In his pastoral work, Fr Vasily met Russian settlers and indigenous inhabitants of the region, Eskimos and Aleuts. He also encountered gold rush pioneers quite often..
Fr Vasily’s first parish was extensive. He was headquartered on Afognak, but he was also responsible for the people on Spruce and Woody Islands near Kodiak. There were several small wooden chapels scattered on these islands. In 1901, as a result of his efforts, the church of the Nativity of the Most Holy Virgin was built at Afognak (Although the village was completely destroyed in the earthquake and tidal wave of 1964, the church building survives to this day). Because of the long distances and severe climate, Fr Vasily’s priestly work was extremely difficult and required many sacrifices. Often he would leave home for several weeks, in order to celebrate the services, to confess, baptize, marry the living, and to bury the dead, while traveling in a specially constructed kayak. Even when he was at home, Fr Vasily had very little time to devote to his dear family. Besides celebrating the services in church and serving the needs of his parishioners, he taught in the parish school and worked in two church homes for the poor. His family bore the arduous conditions, especially the climate, with difficulty. His wife Olga, who had given birth to two daughters, stayed home. The older daughter, Vera, was born at Afognak in 1902. Their second daughter was born two years later, after they had moved to Kodiak. During his missionary service in Alaska, Fr Vasily kept a diary. It has survived to this day as one of the few records of his personal life. Fragments have been translated from Russian and published in Polish. Because of the severe Alaskan climate, which especially affected Matushka Olga, and out of concern for the education of their children, the Martysz family transferred to the continental United States in 1906. As a farewell statement from Alaska that year, Fr Vasily wrote an article for the Russian Orthodox American Messenger, “The Voice from Alaska,” in which he appealed to Orthodox faithful across the USA to support the building of Orthodox churches in Alaska. The family settled in Osceola Mills in central Pennsylvania. Their first son, Vasily, was born that same year, and their youngest child Helen was born in 1908, soon after they moved to Old Forge, PA. Fr Vasily’s work took him to Waterbury, CT, to West Troy, NY, and finally to Canada. He was assigned to Edmonton and then to Vostok, where he became Dean of the provinces of Alberta and Manitoba. In 1910, he celebrated his tenth anniversary in the priesthood. His prolific and loving pastoral activity endeared him to his flock. Church authorities considered him a very effective, devoted and talented priest, while the faithful loved him sincerely, valuing his modesty and kindness. Despite their comfortable lifestyle and the relatively large Orthodox community they served in western Canada, the couple longed for their homeland. They feared the loss of their ancestral identity and requested permission to return to Poland. 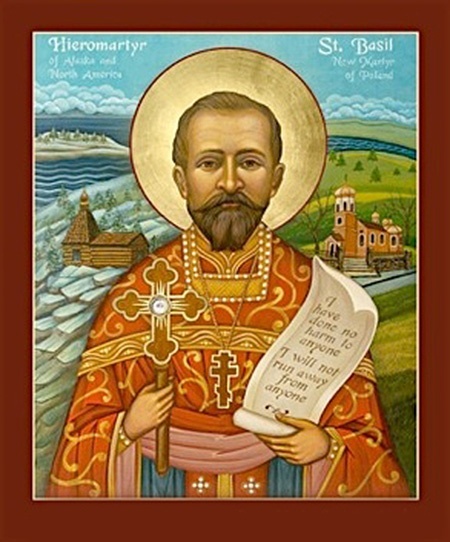 After serving nearly twelve years in America, Fr Martysz left the New World and returned to Europe in 1912. Initially, Fr Vasily and his family lived with relatives in Sosnowiec, where he eventually became rector of the parish and instructor in Religious Education at the local girls’ high school. The peaceful life they enjoyed there lasted barely one year, since the outbreak of the First World war disrupted the lives of thousands. Clergy were considered civil servants who were ordered to evacuate their homes, and move to safety inside Russia. At this critical time, Bishop Vladimir, their Archpastor and friend from Alaska, offered the Martysz family refuge in a small apartment within the St Andronicus Monastery in Moscow. From here, Fr Vasily commuted daily to the distant parish at Valdai, where he taught religious education classes. When the Bolsheviks seized power, he lost this job and was forced to earn a living unloading railroad cars. His own life was endangered because Red Army soldiers often treated clergy with distinct brutality. In 1919, at the end of the war, Polish refugees were granted permission to return to their former residences. Fr Vasily and his family took this opportunity to return to Sosnowiec. They moved back into their former apartment, which had survived the devastation of the war. They did not remain long, however, for that September Fr Vasily was assigned to a position in the newly organized Polish Army, in charge of Orthodox Affairs in the Religious Ministry of the War Department. The whole family relocated to Warsaw. Fr Vasily started the wearisome but important work of forming an Orthodox military chaplaincy. In 1921, he was promoted to the rank of colonel, and assumed responsibility as the head of the Orthodox military chaplaincy. At this time, the church elevated him to the rank of Archpriest. Fr Vasily served as chief of Orthodox chaplains for the next twenty-five years. Within the Ministry of the Interior, he had his own cabinet, and was directly responsible to the Minister himself. Fr Vasily was also a chief advisor and close colleague of Metropolitan George (Jaroszewski) of Warsaw and all Poland. He participated in preparing all the meetings of the Holy Synod, and assisted Metropolitan George in his effort to obtain autocephaly for the Polish Orthodox Church. He accompanied the Metropolitan on the tragic day of February 8, 1923, when he was assassinated. The assassin had also planned to kill Fr Vasily as well, but he was captured before he could succeed. Fr Vasily remained under police protection for some time, but attended to all the details of the Metropolitan’s funeral, in which the First Regiment of the Szwolezers Regiment participated under orders from Marshal Jozef Pilsudski. Fr Vasily zealously participated in the subsequent process of obtaining autocephaly for the Orthodox Church in Poland, which was granted during the tenure of Metropolitan Dionysius (Walednski) in 1925. Fr Vasily became the Metropolitan’s closest advisor and confidant. He often accompanied the Metropolitan and acted as liaison with the Polish Head of State, Marshal Pilsudski. He was often invited to attend cabinet meetings at Belvedere, the Royal Castle, where he regularly signed the guest book on holidays. In addition to his work as chief military chaplain, Fr Vasily devoted much time to organizing pastoral ministry in the Ukrainian internment camps. In February 1921, Fr Vasily appointed Fr Peter Biton as chaplain for the camp in Aleksandrow Kujawski. He visited the Ukrainian internees himself and helped arrange camp churches. On July 8, 1921, he celebrated the Divine Liturgy in the Ukrainian language for over 5,000 prisoners, while visiting this camp. His sermon, delivered in Ukrainian, greatly improved their morale. He also assisted in organizing chaplains’ training courses in other Ukrainian army camps. In October 1963, the earthly remains of Father Vasily Martysz were brought to Warsaw and solemnly reinterred in the Orthodox cemetery in the Wola district, next to his wife and mother-in-law. At the beginning of 2003, his holy relics were uncovered and placed in the church of St John Climacus in Warsaw. The Holy Synod of the Autocephalous Orthodox Church of Poland promulgated the official Act of Canonization on March 20, 2003, and the rites glorifying St Vasily Martysz were celebrated in Chelm on June 7-8. Orthodox Christians in the Polish Army have taken St Vasily Martysz as their heavenly patron. They martyrdom of St Vasily was the crowning accomplishment of his pious and dedicated life, a testimony to his amazing courage. He carried his cross to the end without complaint, accepting the crown of martyrdom as he had dedicated his life to Christ and the Holy Orthodox Faith.